The resources and tools collected in the tabs below are intended to assist the composition of text in the official languages of the Northwest Territories through correct orthography. Developed primarily for internal use, they can hopefully improve accuracy, speed adoption, and refresh typography through the vetting of web and system fonts. Many indigenous peoples have struggled to find Unicode-compliant fonts for use in computer environments in order to represent their languages in accordance with standardized orthographies. 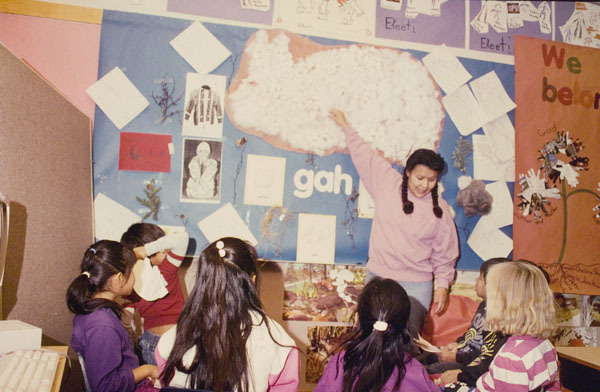 For the five Dene languages in the NWT (which include Tłı̨chǫ), the first dedicated font package, called Vowel First Dene, was created in the 1980s by Doug Hitch, a linguist then working for the Language Bureau of the Government of the Northwest Territories (GNWT). Designed for use in a Macintosh environment, Vowel First Dene became obsolete in the mid-1990s when the GNWT adopted a Windows operating platform, requiring all of their interpreter and translator contractors and educational staff to comply. To fill the gap that this transition created, Jim Stauffer developed a cross-platform font package called WinMac Dene Font. Widely adopted throughout the Dene language communities, the font package allowed Dene words to be shared between Macintosh or Windows computers that had installed WinMac Dene Fonts. However, because most of the characters with diacritical marks were not Unicode compliant, problems arose when Dene words were sent to computers that did not have WinMac Dene Fonts installed. When this happens, the word processing software generates substitutions for the non-compliant characters and, in this way, Tłı̨chǫ becomes Tåîchô. Source: Zoe, J.B., Jerome, S., Andrews, T.D., and Saxon, L. (2012). Letter to the Editor. Arctic 65(3). Fortunately, support from standard Unicode-compliant font sets has improved remarkably over the years. Currently, Microsoft Office fonts such as Cambria, Calibri, Arial, and Times New Roman offer solid support, with partial support found in other fonts. It has thus become possible to move away from the non-standard WinMac font, a process that is currently underway in the NWT. Dogrib Language Classes in St Pats Elementary Yellowknife. NWT Archives/Northwest Territories. Dept. of Public Works and Services fonds/G-1995-001: 6916. Dogrib Language Program Elizabeth Mackenzie School-Rae Edzo. NWT Archives/Northwest Territories. Dept. of Public Works and Services fonds/G-1995-001: 8566. 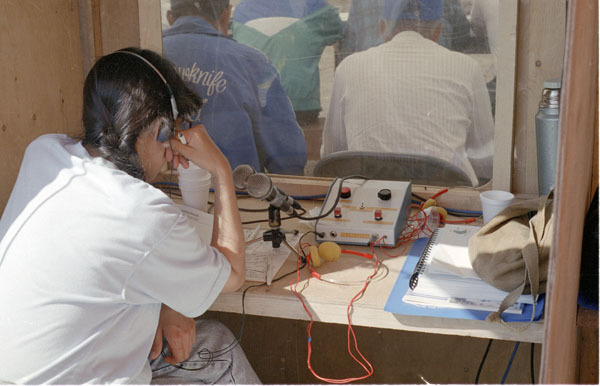 Dettah – 1990 Dene National Assembly. NWT Archives/Rene Fumoleau fonds/N-1998-051: 4307. Cecilia Zoe Martin, Tłı̨chǫ language teacher, Elizabeth Mackenzie School Rae. NWT Archives/Northwest Territories. Dept. of Public Works and Services fonds/G-1995-001: 7583. 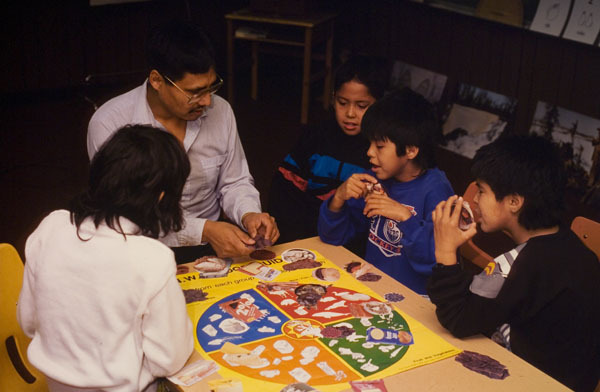 Dettah – 1990 Dene National Assembly. NWT Archives/Rene Fumoleau fonds/N-1998-051: 4179. In 2015, the Prince of Wales Northern Heritage Centre prepared a comprehensive presentation on various issues relating to Indigenous language orthography in the Northwest Territories. Ɂ The glottal stop can be found in English as the sound between “uh-oh”. It is indicated by an apostrophe after consonants and a glottal stop (ʔ) character at the beginning of words or after vowels. Ł An L with a stroke is used to indicate a “breathy l” found in the words “flip” or “slip”. It is often seen following a “t” as in Tłı̨chǫ where it may sound closer to “cl” than “tl”. à è ì ò Used in Tłı̨chǫ and Gwich’in, low tone vowel forms usually involve holding the tone longer than the plain form. It is indicated by a grave accent and is often combined with an ogonek to give a low nasal tone. In Slavey and Chipewyan, the low tone remains unmarked. á é í ó ú High tones in Slavey and Chipewyan are indicated by an acute accent and can be combined with an ogonek to give the high nasal tone. In Tłı̨chǫ and Gwich’in, the high tone is left unmarked. ą ę į ǫ ų Familiar to French speakers, nasal forms in most Dene languages are indicated by an ogonek, a little hook similar to a reversed cedilla placed under the vowel. ë ɘ These Chipewyan/Slavey vowel forms marking a mid-high tone are often orthographically abandoned in favour of a plain “e” but is voiced in a slightly higher tone from the centre of the throat. The table below provides the character entity codes to transcribe Dene characters in HTML documents without the need for the Unicode characters which can increase the load times and sizes of files significantly. The following fonts have been evaluated and found to satisfactorily implement diacritical marks and the Latin Extended A and B character sets that include Dene characters. While the placement of diacritics continues to present challenges (e.g., cramped positioning above capitals, misplaced location of accents, failure to double stack on top of characters, etc. ), these fonts will do a reasonable job for most text in Microsoft Word and Outlook (results vary for other applications). They are free to download and use. Instructions have also been provided on how to use these fonts on websites. Note that appearance of the fonts may vary from computer to computer, with the most modern browsers and operating systems displaying the diacritical mark placements with the most fidelity. Note that larger file sizes impact page load time for websites. As such, it is suggested that only required font styles are used in the stylesheet of each page. Language Geek (Chris Harvey of the Indigenous Languages Institute) offers font sets that contain full support for Canadian Indigenous languages including Syllabics. Other fonts, as well as keyboarding and orthography tips, have been made available. Recently, Chris has prepared a lightweight multipurpose Roman font called Omnes which is small enough to pack with websites through a CSS @font-face call. The SIL group, a pioneer in multilingual font and keyboard development for literacy, has recently released two attractive multilingual fonts, Gentium Plus and Andika, which reliably represent Dene diacritics. SIL also revised their popular Charis and Doulos typefaces for Unicode compliance. These sets are perhaps the most reliable in terms of phonetic symbols and the correct placement of diacritical marks. For the last few years, Google has offered websites the ability to use their collection of beautiful Unicode fonts for general site typography. While most have limited character sets, some fonts include the necessary characters from the Latin Extended Sets A and B to transcribe Dene text. However, combining diacritic forms give varying results leading to the need to tweak character representations. Recently, two new fonts, Noto and Arimo, have been developed to accommodate multiple languages, with compatible character heights and diacritic positioning. They can also be downloaded for personal computer use. The following tool will allow you to convert legacy text composed in Vowel First Dene or in the WinMac series of Dene fonts to the international standard Unicode. Simply paste your text into the top text area, click the appropriate converter button, and obtain the updated text in the bottom area, with or without the removal of the dot over the ‘i’ as preferred in some regions. You can also convert the output text to HTML-ready code or try out the new text in different fonts that are known to fully represent the requisite characters on most systems. Two Microsoft Word macros have been developed by Jim Stauffer and Rajiv Rawat to facilitate the conversion of legacy text composed in the popular Vowel First Dene and WinMac series of Dene fonts to the international standard Unicode. The zipped package contains instructions on how to install the Macros and their source code. Two simple macros have been developed to install commonly used Indigenous NWT place names in the AutoCorrect tables of the Microsoft Office Suite and update the Custom Dictionary with the same (Windows Only). This allows for the automatic placement of correct diacritical marks over characters without needing to type them in manually and the recognition of place names by the spelling checker. The script can be run as is on Windows systems or as a macro by opening the Word template file on Windows or OSX system (the Dictionary Updater only runs on Windows). Suggestions for the inclusion of other commonly used words is greatly appreciated. Press and Hold is a relatively new feature on Macs that allows for quick access to character variants by a sustained press of a key. By installing the accompanying file in the specified System package, these variants can be tailored for Dene and other roman orthography. Please note that both the macros and keyboards listed on this page are being provided freely “as is” for public trial without warranty of any kind. Feedback on their utility is most welcome, but they should be considered purely experimental. Tłı̨chǫ has benefited from an ongoing partnership with the Department of Linguistics at the University of Victoria. Over the last decade, the university has worked with the Tłı̨chǫ Community Services Agency on an online Tłı̨chǫ dictionary that was converted into an iPhone App in 2012. Also in 2012, language Apps for each the Dene languages were successfully released in the NWT. Incorporating flipcards, word practice, and quizzes, the Apps were geared towards basic literacy education. In 2011, the Deh Cho Friendship Centre sponsored the development of the Dene K’ę́ę́ Gúdeh DVD-ROM, an animated, interactive introduction to Dene Zhatie geared towards children. With funding from the GNWT, Government of Canada, and the Dehcho Divisional Education Council, the DVD was later adapted in 2013 as a website, an iPhone App, and standalone downloads for both Windows and Mac platforms. Theytus Books (BC) has been packaging interactive multimedia CDs with a book series on Tłı̨chǫ legends for the last half decade. The CDs provide a language primer by highlighting words alongside English and Tłı̨chǫ narration of a Tłı̨chǫ story. The South Slave Divisional Education Council has developed a number of online tools and materials to teach Indigenous languages in their region, including dictionaries, bibliographies, and animated storybooks. The information aggregated here has benefited from the input of many community experts . A big thanks goes to Jim Stauffer, a Whatı̀ based veteran community educator, and Chris Harvey of the Indigenous Languages Institute, both of whom pioneered and supported font development for Dene languages. The advice of the ECE Official Languages bureau, Deb Simmons, Betty Harnum, and Kristi Benson was also key to bringing this compilation to fruition. Dëne Dédlıné Yatıé Ɂerehtł’ı́scho Denı́nu Kuę́ Yatıé – Chipewyan Dictionary. Fort Smith, N.W.T. : South Slave Divisional Education Council, 2012. English-Chipewyan Dictionary. Prince Albert, Sask: Northern Canada Evangelical Mission, 1981. Gwichyah ts’at Teetl’it Gwich’in Ginjik Gwi’dinehtl’ee’ – Gwich’in Language Dictionary. Gwich’in Social and Cultural Institute, 2003. Sahtúot’įne Dictionary Délįne Kǝdǝ́ – Dialect of the North Slavey Language. Norman Wells, N.W.T. : Sahtu Divisional Education Council, 1986. K’ashógot’ı̨ne Dictionary – Radı̨lı̨h Kǫ́ę́ Dialect of the K’ashógot’ı̨ne xədǝ́. Norman Wells, N.W.T. : Sahtu Divisional Education Council, 1986. Shúhtaǫt’ine Dictionary – Tulita Dialect of the North Slavey Language. Norman Wells, N.W.T. : Sahtu Divisional Education Council, 1986. Dene Yatié K’éé Ahsíi Yats’uuzi Gha Edįhtatł’éh Kátł’odehche – South Slavey Topical Dictionary: Kátł’odehche Dialect. Fort Smith, N.W.T. : South Slave Divisional Education Council, 2009. Tłįchǫ Yatiì Enįhtł’è – Dogrib Dictionary. Rae-Edzo, N.W.T. : Dogrib Divisional Board of Education, 1996. Tłı̨chǫ K’ę̀ę̀ Ets’eetł’èe xè Enı̨htł’è K’e Yats’ehtıı – Reading and Writing in Tłı̨chǫ Yatıı̀. Behchokǫ̀, N.W.T. : Tłı̨chǫ Community Services Agency, 2007. Species at Risk (NWT) Terminology Translation Workshop – Report and glossary of translations in Inuvialuktun. Yellowknife, N.W.T. : Species at Risk Secretariat, 2011. Protected Areas and Science terminology. Yellowknife, N.W.T. : Protected Areas Strategy, 2006. 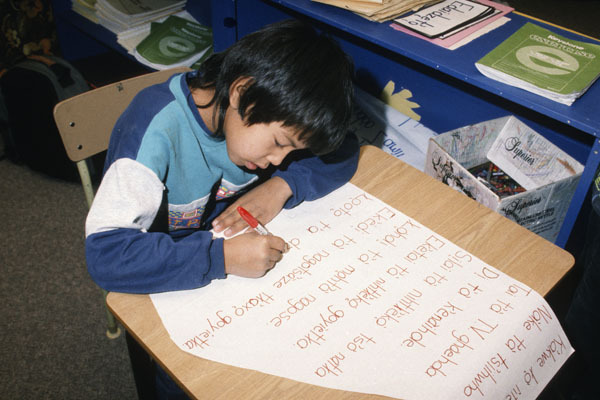 Keeping our minds strong : a discussion paper on revitalizing Aboriginal languages in the NWT. Yellowknife, NT: Office of the Languages Commissioner, 2002. Revitalizing, enhancing, and promoting Aboriginal languages : strategies for supporting Aboriginal languages. Yellowknife, NT: Northwest Territories. Dept. of Education, Culture and Employment, 2001. Languages of the land : a resource manual for aboriginal language activists. 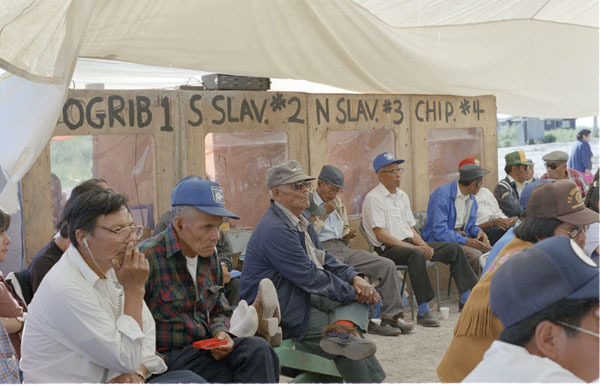 Yellowknife, NT: NWT Literacy Council, 1999.